On a Wednesday afternoon, we visited the Oxford University Museum of Natural History. 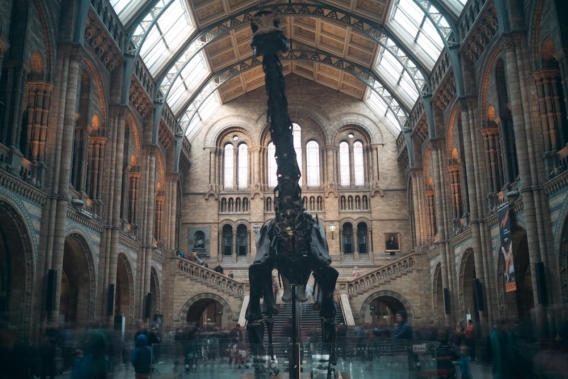 The museum preserves thousands of specimens and fossils that were collected from many different eras. Meanwhile, our guide explained Darwin’s theory of evolution in great depth. After the evolution workshop, we had time to look at all these priceless collections displayed on a long corridor with descriptions, sorted by time. From the Cambrian Period to the Holocene, the museum illustrates the changing face of the earth and the evolution of its creatures. The other interesting part was the workshop on evolution. The museum staff explained the basic background of Darwin’s theory and showed us a fossil of an ancient horse that was the size of a hare. Next we had to taste a bitter chemical in order to prove if we have the gene that is able to taste something very bitter. In the end, the guide brought some Madagascan hissing cockroaches, which is a special insect that still preserves some ancient features. After our workshop, the guide showed us the museum’s loft. A few centuries ago, British scientists gathered in here to debate their theories. Today, this loft has already been transformed into a specimen warehouse; specimens of insects are classified and stored in here. In my opinion, this off-campus activity was totally successful as it was different from school biology lessons and it teaches us knowledge in a unique way, that encourages students to explore the unknown by themselves, instead of learning in a classroom.